Today we are going to talk about how to improve your performance on Facebook. If you didn’t know all of your posts that you make on Facebook do not show up in the News Feeds of every one of your fans. This news flash can come to a shock to many and even piss a few off. For example Mark Cuban (Dallas Maverick’s owner) or George Takei (Star Trek Star). 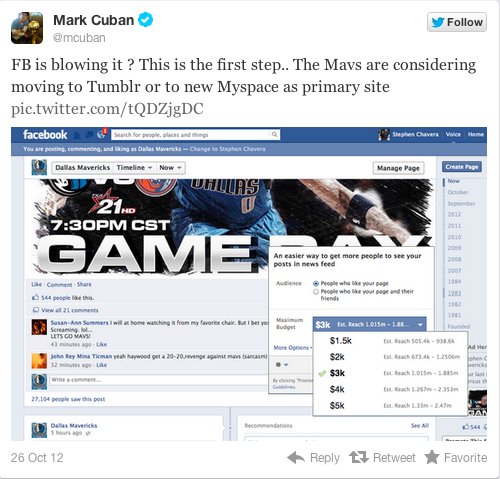 Mark Cuban is very angry with Facebook because he doesn’t get publicity for free anymore. Businesses have to pay to reach the fans that have already liked their page. Below is the Tweet and screen shot that Mark Cuban shared out to his twitter fans when he realized he would have to pay $3,000 to reach a million fans. I mean honestly I think Cuban is overreacting a bit. When I went about researching Cuban I noticed that he gets mad at a lot of people. Facebook just ticked him off at the wrong time but I don’t think he has a valid excuse to be angry. Facebook is a free source for the basic social media platform but they can’t be a charity and need to make money some how. Businesses pay for advertisements everywhere else so why shouldn’t they have to pay for it on Facebook. If branded pages were given free rein on Facebook to push as much advertisement as they wanted for free to every user, then the users are going to get fed up. We don’t use Facebook to get blasted with advertisements and I believe Facebook is just trying to protect the life of the site and the loyalty of their users. Now your probably wondering how Facebook goes about choosing what is placed in people’s News Feed and what isn’t. Understanding this concept is going to help improve your Facebook performance. Facebook uses this algorithm that they call EdgeRank. You may read some articles that state it isn’t called EdgeRank and there are hundreds of new factors that affect whether your post is shown or not, but I am just going to give you the most important basics. If you would like to read more about the changes please follow this link: EdgeRank is Dead. As you can see in the picture above, there are three very important factors that you should focus on. Affinity: This is your relationship with users. The amount of users that have interacted with your page in the past affects how likely they are to see your posts. If they’ve clicked, liked, or even commented on your posts in the past, EdgeRank assumes that they are pretty interested in what you have to say, which gives it higher priority to show in that user’s News Feed. Weight: This is how much priority EdgeRank gives to your post, based on the post type. Facebook has a hierarchy of post types, which photos and videos take top priority. Links come in as a second priority and your plain text status are at the very bottom. 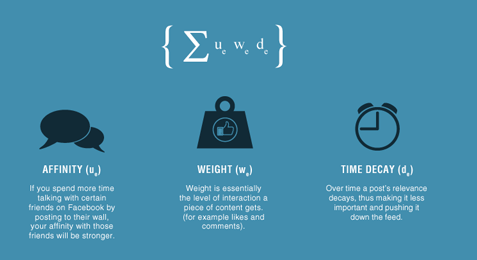 Interactions with other users , like comments, are more weighty than likes. Time Decay: This is how old your post is. The longer your post is on Facebook, the less likely it will show up in a user’s News Feed. Your post is going to be more relevant to users who check Facebook constantly versus Facebook users who only check it once or twice a week because of this time decay aspect. Now there are four things that EdgeRank checks every time you post and you should make sure to take this into consideration when trying to improve your Facebook performance. The more you engage with a friend or a page, the more likely you are to see their posts. If you often engage with a certain type of post you’re more likely to see posts of that type. 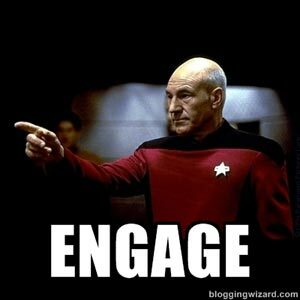 The more Facebook users engage with a post, the more likely you are to see that post. As more users give negative feedback, the less likely you are to see that post. Now that you are aware of the basics I am going to talk about the 5 most important things you need to do to get into the News Feed of your users. 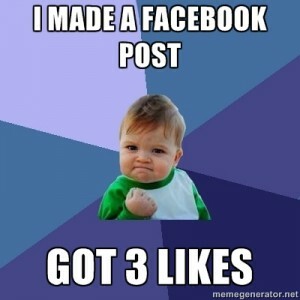 I have heard and read many conflicting data that states when the best day is to post on Facebook. This is honestly something you need to experiment and play with. Try Google Analytics to study your data. The picture above shows that the end of the week is best time, but once again it depends on your users and business. What I do know is that you should post regularly and mix it up. You want to make sure that your new posts are replacing the old posts. In this society people don’t like to read very much, or at least that is what I have noticed in my experience. Photos are self-explanatory and gain more engagement. Videos are also a great way to bring engagement in and are more interesting than text updates. Images tell a story and the best ones are the ones that people don’t have to wonder and question about. Ask questions, create contests, have fill-in-the-blank statements. Do whatever you can do to gain the attention of your users and make them want to participate. This will bump up your affinity score with the users and will give your future posts a higher chance of reaching their News Feeds. No profanity. Complaints about your Facebook posts will harm you way more than you think. There have been many of times that I have unliked, even complained about a page because of profanity on their site. Make sure to watch for spam so that you can avoid negative feedback. This is not what you want! Quality posts are the most important thing you can do to improve your Facebook performance. Make sure you are consistent as well because you are more likely to receive engagement that will push your posts into the News Feeds on a regular basis. People realize when you are not spending time on your posts and they will punish you for that. Of course there are many others things you can do to improve your Facebook performance but if your boss asked you to improve your Facebook performance in one month, then focus on the five factors above and keep in mind the factors that EdgeRank looks for. This will help boost your performance and then you can begin focusing on other aspects. At one point in the world there was this thing called a checkbook and people would spend all this time writing in information so they could pay for their groceries or what not. It was long and tedious and usually pissed off everyone in line. While we had checks we also had cash. People would have to dig through their wallets and purses to find the right amount and if they didn’t have enough well then they were a bit out of luck. While these two things still exist, they might as well not. I personally never carry cash on me and my checkbook is only every used for online check transactions. The way of the word is the debit and credit cards, but not even the physical versions of them. Like I was mentioning in my last blog, phones have taken over the world and now you can pay almost anything with your phone. If you can’t tell already today’s topic is about Mobile Payment. 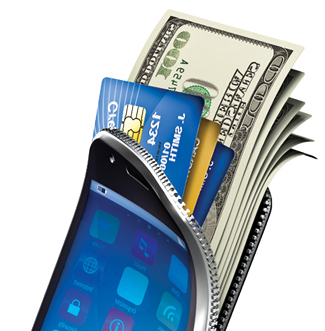 Smartphones have become the new credit cards. There are many apps out in the smart phone world where you can put all your credit/debit information in and pay for everything. I personally don’t like the idea because I like having a physical card in my hand but I can see the draw to it. It makes life easier and you never have to worry about losing your wallet or the card itself. I mean who really loses their phone these days? If we are more than a foot away from it people start to panic. It’s a great solution for a problem that was never really there, but that could just be the pessimist in me talking. Talking about these apps , Google(http://www.google.com/wallet/) has an app: Google Wallet. What is weird about this app is it only available for Android phones, which might be the reason that this product is not profiting. That doesn’t seem to faze Google though because it isn’t money they are wanting. It is your information. Think of the information you are giving these companies. They know more now than you ever wanted them to know and once again you gave it to them freely. LevelUp(https://www.thelevelup.com/) also as an app. I would say this app is better than the Google Wallet because it can be used on a smart phone. There are up to 5,000+ locations that you can use the app and they even give you rewards, depending on what new places you have tried. What I do like about this app and about the concept of mobile payment is how it helps the businesses. 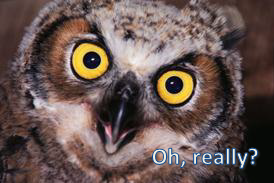 LevelUp states on their website “LevelUp charges a flat 2% payment processing fee. It’s that simple. No hidden fees. No monthly fees. Just 2%. And we pay out directly to your bank account next day, every day.” LevelUp wants to save the businesses money and wants to help them make money in an easy and helpful way. Also for the businesses side the history of people who came to your store is a great perk of this app. Businesses can generate campaigns and reports about people who use the app to come to their business. All in all, this is the way of the world. Soon we won’t have phones anymore and our credit/debit information will be implanted into our thumbs. You can attempt to hold out but it won’t last long. If you are a business I suggest you get on this train and begin allowing this to happen. It will be great for your business once the consumers get more on board. Before I end this post I want to bring up one more topic, relating to virtual payment: Bitcoin. If you are like me then you have never heard about Bitcoin. Bitcoin was created in 2009 by a pseudonymous hacker who calls himself Satoshi Nakamoto. This product is a form of virtual cash, that is used to buy goods and services online. There is no backing by the government or a central bank and the value is created purely by demand. Don’t worry this won’t replace cash anytime soon but it is defiantly getting up there in popularity, especially in Canada. Below is a picture of a Bitcoin ATM. These ATM’s have been placed in Canada. People can put money in to have virtual coins or they can get money out. The bitcoins are transferred to and from the customer’s online bitcoin wallet. I really don’t see how this is any better than a normal ATM but this process is a lot cheaper than accepting Visa or MasterCard. It is supposed to be extremely secure but this can be used for illegal activity. Bitcoin had been used as a front to buy illegal drugs and I honestly think I am going to pass on this new fad. 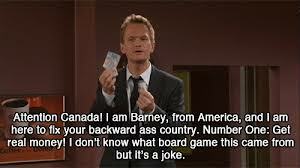 In the words of Barney Stinson. Phones rule the world. People are addicted to having information at their fingertips and I can’t say I haven’t been affected either .I usually can’t go ten minutes without checking my phone. I wish I could say I was checking for emails or working, but usually I am just checking my social media apps, like Facebook, Twitter, LinkedIn, etc… Mobile marketing and apps have been improving so much that it is causing the society’s addiction to grow stronger and stronger. 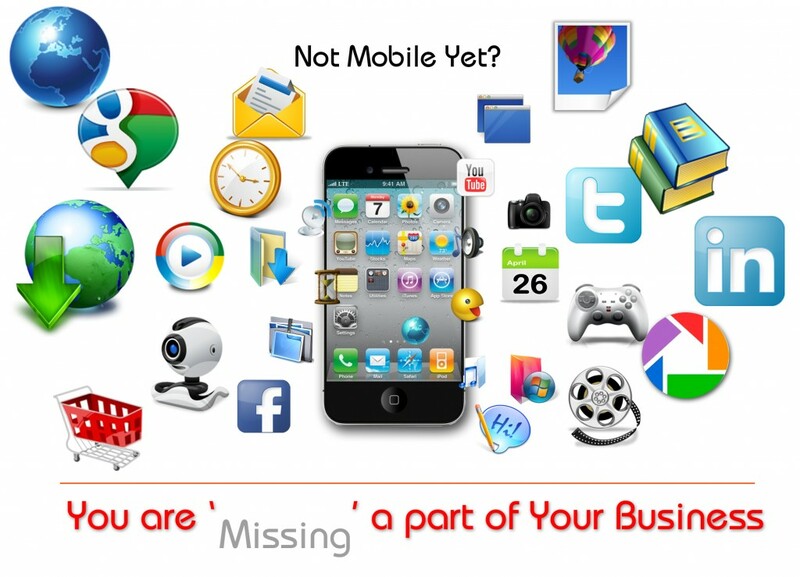 Mobile promotions is actually very simple and something your business should be participating in. There are a variety of mobile promotion tactics that have been used successfully by businesses globally and locally. These include mobile coupon incentives, sweepstakes, and user polling apps. . Each has different rates of success, but is best used with an objective that is the goal for the mobile promotion. Sweepstakes have the objective of drawing in new potential customers. A mobile promotion sweepstakes generally invites users to send a text message to a short code address. They enter and there is a drawing for prizes at a later date. This encourages the users to keep in touch and offer more information about themselves in the process. Mobile coupon incentives have the objective of gaining demographic information about a user’s regional shopping habits. This kind of mobile promotion enables marketing of customized coupons; it lets the customer participate directly in the process. This is always a big incentive to create customer brand name loyalty. User polls and apps that allow voting are very popular. Consumers do appreciate being heard. The objective is to have the user reveal detailed information about themselves and their shopping habits. By answering the well-chosen questions in the opinion poll application, they are already fulfilling the goal and the objective. There is little risk associated with any of these tactics, but the rewards can be amazing. Each is guaranteed to offer new insight into the users and customers that are interested in the promotion. Location: Unlike a computer, your phone will give your promotions to places of where you are currently located. Let’s say you’re a Washington native but are currently in Oregon. Your computer is going to make it look like you are located in Washington and only give you ads to there, which is pointless if you are located in Oregon. Phones will send you ads for Oregon and that is greatly beneficial for you business, so that customers can be presented with ads to your business. This will help bring new customers into your business and create word of mouth advertising, especially if they go back to Washington and give a raving review. Your also not just targeting the natives, but the tourists. Tourists can bring in a large profit, depending on your business. Timing: The times that your ads go to customers phones is key. For example if you run a restaurant you wouldn’t want ads promoting your breakfast special to be sent to customers at 2 pm. You want to schedule your ads at peak hours, so that you can target customers that are most likely to use the promotions at the specified time. Also timing is key because it allows for your ads to be immediate. Unlike computers you can just send your ads to the phone at the time you want and people will see it at that time. Relevance: Like I have been saying all along your content needs to be good and it need to be relevant to the customer now, not in a week , but now. This is a moment to engage your customer and have them act now. Context is not easy to implement and if you provide it to the customer at the moment they are seeking the information than you are going to raise sales and ROI. Offer your customers a text messaging surface. For example when you are in a movie theater and there is an ad to text a certain number that will find out what your phone is “dreaming” while the movie is going on. That is relevant to what they are experiencing and is the prime time to get customers to participate in an easy and fun way. Now lets talk about apps. I love apps. I think that they are awesome and they are the best way to bring customers to you. Your app needs to be up to date and it needs to be easy for the customer to use. There have been many times when I have attempted to use an app and they are not user-friendly. I would have to say my favorite app right now is the US Bank app. I can easily access all my information, deposit checks, and make transfers. Why is this app so successful? Well first thing is they provide a great product and they create a great virtual opportunity where the user can be engaged at a moments notice. It doesn’t matter what time the user access the app but it is accessible for everyone. I know that iPhones are the way of the world and if you are anyone you are expected to have one, but 50% of the market has an Android. Make sure your app is usable for both iPhone’s and Androids. Make sure that you don’t try to hit every person with your app. Choose a smaller market, people who want what your app offers will make sure they will use your product. Smaller markets will allow for you to create brand loyalty and to bring new customers in. I talk about my US Bank app all the time and if I meet anyone who has US Bank I tell them to get the app because it does everything I want it to do . The next key to a successful app is to track everything. Last week I talked about database marketing and that applies to phones. Track the customers that use your mobile site and what they use through that site. By tracking your customers you will know what aspects of your app they using and what they are not. This will allow for you to improve upon the features you offer and make people want to use them even more. They will also provide you with information you want. If you have polls or surveys, that offer a chance for customers to give opinions on what they want improved, then you will obtain data that will improve your app without anyone publicly posting negative feelings. The next key thing you need to have for an app is make it FREE. I download apps that are free because I am a broke college student and don’t want to pay for anything. By making an app free that doesn’t mean that you don’t earn profit off it. This is like when you create a YouTube channel and everyone views it for free. Eventually you are going to make money off it. People are going to love the product you are offering and will eventually buy your product. That is the goal right? App development is not easy and it takes time. Make sure you keep developing your apps because someone is going to have issues with what you are providing. I love upgrades because I know the product that I love is already improving. Here is a link to learn how to improve apps. Last week I spoke about SQL and how to use it when searching through your database. What I didn’t go into was how you optimize the data that makes the database. Today I am going to talk about how to market the data in your business database. This is a form of direct marketing that uses databases of customers or potential customers to generate personalized communications in order to promote a product or service for marketing purposes. Database marketing takes advantage of information in the marketing database to develop and implement action plans to enhance marketing results. There are many ways you can use database marketing for your business. Some ways are very beneficial but then there are ways it can be used that could be detrimental to your business. The benefits of database marketing is that it can improve profitability. It does this because you can specifically target and allocate resources to improve efficiency, which increases your profit margins. This also improves your sales because if done well you can save money by limiting the unprofitable markets segments. Database marketing also enhances communication with your customers because you can look at all the data you collected and see which types of communication are consistent and worthwhile to keep up with. Another benefit is that database marketing can improve your products. By collecting information about customers buying habits and the commentary they provide you, you can keep improving the products that need improvement and drop that products that are not beneficial to your brand. An example of this is Starbucks and their loyalty card. 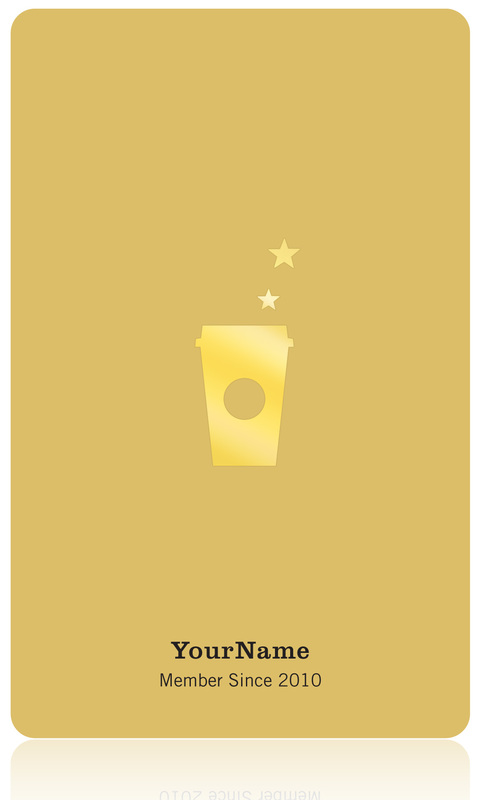 Starbucks currently has 6 million registered card members. By being a member Starbucks is collecting data about you; the kind of drinks you get, what time of the day you get a drink, how many times a week you buy a drink, etc… So Starbucks took all of this data that they collected and can now segment their customers into different markets. They can create personalized promotions to send to specific gold members immediately, usually through your mobile device. By using the data collected, not only are they able to communicate with their customers better, but they have been able to focus on the key indicators that effect a customer’s satisfaction and attempt to improve upon them. Another great example of database marketing is going to take us across the pond to British Telecommunications. They partnered with Devon Direct, a full service direct marketing agency. British Telecommunications main problem was customer retention. By using the data in their database BT created fully customized and personalized brochures for their customers. These brochures introduced new products and services that might be of interest to the customer. The personal savings and order forms were customized specifically for each customer, based on the database information. By doing this and sending out over a million brochures a week they gained response rates of 14%-32%. In one mailing, one-third of the 11.5 million households responded to the brochure and bought one of the products. Now this was not easy for BT to do. Behind database marketing are very highly skilled techies. Granted everyone should learn how to fiend for themselves when it comes to databases and looking through data, but to customize and personalize advertisement successfully you are going to need IT people. The software structure behind personalization is very complex. Now I have painted a bit of a pretty picture for database marketing but be aware you can go down a wrong path when using database marketing. A very popular example is Target. You probably have heard about the discovery that Target made after going through thousands of pieces of customer data, but if not I will give you a brief overview. Target knows everything about you. They have demographic data on you and they have trends based on you. They essentially want to be you, so that they can know exactly what and when you going to buy and have the products available for you. Target began studying the shopping habits of customers who were going through life changing events, particularly new parents. They studied what these customers bought once they had a child and then dug into their history and analyzed what they bought before the child was born. One trend that Target found was women will buy large quantities of lotion when they are in their second trimester. 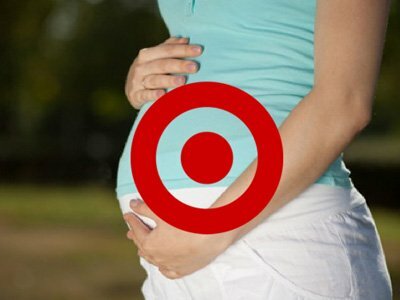 In the end Target found 25 products that women are likely to buy when they are pregnant. They even were able to estimate due dates. By knowing this information Target began sending out coupons to customers who they believed to be pregnant. They would even be sending coupons out to customers who didn’t even know they were pregnant. To Target this didn’t really seem like a huge problem, just another way to market and gain profit. Then a parent came into Target and began accusing Target for sending his “not pregnant” child maternity coupons. Eventually the father found out he was wrong and obviously needed to have a few more conversations with his daughter, but the lesson of this story is they were invading the privacy of the customers. Granted most of the advertising these days invades our privacy but it does it in a way that we don’t really notice it. By just sending customers personalized coupons about being pregnant Target was flaunting it in the customers face that they knew more about them then they knew about themselves. Target was luckily able to catch this problem before it became to large and now are hiding the fact that they may know you are pregnant. They are doing this by putting random ads, for like rakes, on one page and the other page has maternity sales. I guess the moral of this story is pay attention to the ads that Target sends you because they may be trying to tell you something. As you can see database marketing is a great way to better your business and the products that you provide but it can be a little disturbing for customers. Make sure that when you begin utilizing database marketing that you keep your customers in mind and how they might feel about the information that you know about them. Below is an example of what SQL can look like. This is an excerpt from Access, showing how SQL Query Commands works. SQL has a certain syntax to it and it involves a lot of capitalization, so be ready to put your caps lock on. You can easily use these types of databases and SQL as your relational database to data mine. Data mining can dig up relevant information that is scattered through departments. If you have read my earlier blog about coding you are well aware that coding is important. It is becoming essential for marketers to become technical and learn computer languages. Anyone can learn these skills and you don’t have to have certain talents, just a willingness and determination to learn. If coding seems scary or too hard for you I would suggest you learn SQL first. This is much easier than coding because it consists of English statements, like SELECT. When you are ready to learn more complex coding, having SQL in your background will be very helpful. I bet it would surprise you how SQL is everywhere. it is in your PCs, laptops, mainframes, and even your mobile phones. What is wonderful about this is system is it is used to communicate with the database and will answer complex questions in seconds. By having your marketing team learn this language they are going to be able to execute queries by themselves instead of waiting for the techies to get it done. This means faster results and more time for innovation. One company that is proving SQL is relevant in today’s marketing is MemSQL. They have invested $35 million in securing Series B funding. This investment is going to enable the company to expand product development, support its growing customer base and capitalize on the market for Big Data technologies. This company was founded in 2011 by former Facebook engineers Eric Frenkiel and Nikita Shamgunov. If they are from Facebook then they must be legit right? To give you a little bit of background on MemSQL, they are the world’s fastest in-memory SQL database that accelerates applications, powers real-time analytics, and combines structured and semi-structured data into a consolidated Big Data solution. Granted that this is a SQL company and so them spending money on improving the technology isn’t that surprising but the fact that they are willing to spend this much, with the idea that other companies will be using it is a big deal. 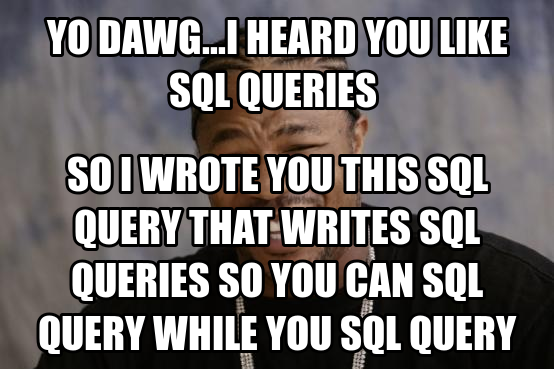 SQL is a happening thing. It just seems to be behind the scenes but I think that coding in general is behind the scenes. If you aren’t involved in the coding world than you really would never know the extent to what it entails and that is just another reason why you should learn how to code. They are using MySQL to host their database. By using this they were able to find my information and send me an email. They used SQL to look up customers who hadn’t been to the dentist in a while and may need a reminder. Yes, I haven’t been to the dentist and now that I have announced this publicly I better get into see them. 🙂 I just love this example because it shows that even small business use SQL and it isn’t just for the large companies. Another company that is very successful with database marketing is Amazon. They collect massive amounts of data on its customers and their purchases and mines this data to see what purchases are commonly made together. This then leads them to being able to give you suggestions and pair you with items, while your shopping and after checking out. By using SQL they are turning this data into knowledge. A/B Testing is the scientific method of marketing. It is used to test different aspects of marketing techniques your business uses to find out which one is more successful than the other. Lets use the diagram from above as an example. Lets say your business is trying to figure out to gain more traffic to your website through subject lines in your email. You have a Group A (Control Group) and Group B (Test Group). Group A is going to be your control group, so if you have a subject line that you normally use or a constant format for your subject line then you would still use it here. For example I am responsible for sending out the emails for my marketing club. Typically I use the subject line “SMA Meeting (Date)” This is what I would use for Group A. Now Group B is your testing group. This is where you use your experimental subject line. For example to draw more members to come to the next weeks meeting I might use the subject line: “SMA Networking Social”. After you have your Group A and Group B it is time to pick who should be sent which. This should be completely random. You don’t want to be bias towards who sees what because that could cause your data to be skewed. Some suggestions would be just randomly choosing half and half or creating an excel sheet and choosing a random number and then counting the list till you get to that number. Once you get to that number take that email and start all over again. Once you have your groups set make sure to set a conversion goal. For example with the email subject line you could use a conversion of how many people open the email or if that is showing little data, how many people go to your webpage through the email link. One thing to keep is mind is that you need to make sure you are testing both of these subject lines at the same time so that everyone is getting the same information in the email and to minimize the outside variables affecting the users decision to open/not open the email. When it comes to email a great site to use is MailChimp. 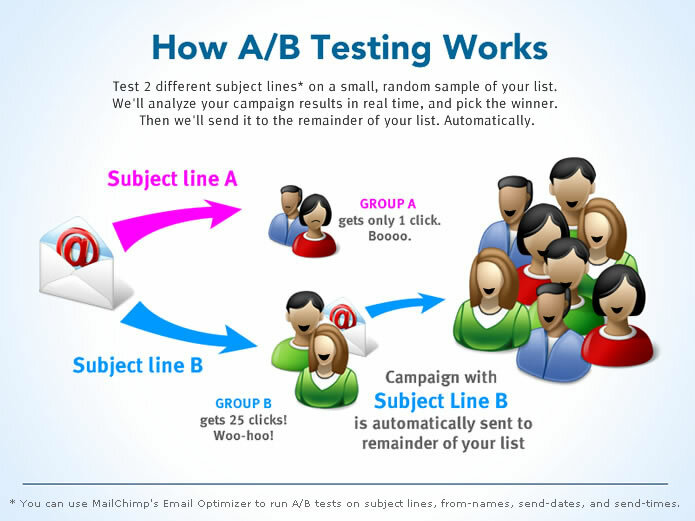 Follow this link and it will give you the steps to creating a A/B campaign through their site : http://kb.mailchimp.com/article/how-can-i-run-an-a-b-split-test-campaign-on-my-content/. MailChimp can track how many people open your emails or follow the link on the email and other exciting things! If you are deciding to test variables on your webpage you can easily create a code to embed into your website. Visual Optimizer can take you through the steps if you follow this link: https://visualwebsiteoptimizer.com/ab-testing/. So you have set up your conversion rate and now it’s time to get testing! Like I stated earlier, test both groups at the same time. Make sure you don’t stop your test too early. If you end a test too early than you will not have as much information as possible and you may not be able to make valid conclusions. On that note make sure you don’t end too late because this could begin to make you lose conversion rates all together. I wish I could tell you what the perfect length is for your A/B testing but it really all depends on what your testing and what your goals are. Luckily Visual Optimization has a handy-dandy calculator that you can use to figure out a suggestion of how long you should keep your testing going. The calculator is located through this link: http://visualwebsiteoptimizer.com/ab-split-test-duration/. Now once you have tested to the fullest you get to look at the data. To me this is the funnest part. Being able to analyze data and see if your hypothesis was right. Sometimes the results can be way different from your hypothesis but you do not know best. Yes, really. Numbers tell the truth as long as you did your testing correctly. Granted there will be some skewed data and sometimes your A/B test is going to fail, but do not go with your gut feeling. Also if you do not like the numbers that are showing half way through your test DO NOT MAKE CHANGES. That will cause more variations in your data and you would have to throw all of your data away. So once you have analyzed your data the one that reaches your conversion goal the most will be the one you want to go with. For example if one subject lines gives you 25 clicks and the other gives you 5 clicks, then you are going to want to go with the 25 click subject line.